Get The Glow: You must use proper lighting to get that glow in this special occasion. Try to set up the dining table with clusters of small candles and brighten the walkway with proper lights. You may also consider replacing the harsh white bulbs with soft flattering ones. Set The Location: Try walking throughout the entire venue before setting up the decor of the party. Identify the areas which can be highlighted, be it a grove of trees or the grand staircase. Work on the Entry: The entry points must be decorated with greenery or front door decorations. A visual welcome can be arranged by creating a tent at the gate. Select A Theme: Try choosing a theme for the decor. It can be anything like a pairing of two colors, monogram, repeated elements, a particular flower or food etc. Entertainment: Try to arrange some stuff of entertainment in the party. 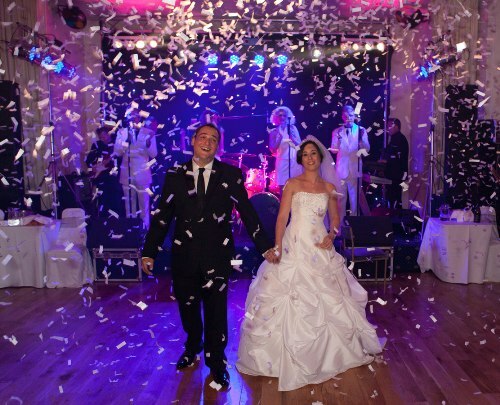 You can book celebrities for weddings, like the musicians or the DJ. For the cocktail section, you can hire musicians and can also hire a disc jockey for arranging a dance party. Set The Dress Theme: You can surely ask the musicians about the dress to be worn in the party. For a wedding reception party, suits or tuxedos will go better. Narrow Tables: While arranging the party, you must look at your budget also. Try narrowing down the tables so that you can save space. The family tables should not go wider than 36 inches. This will save costs of the centerpieces as the space will not be enough for them. Day-time Party: After dark, many venues may charge more for some of the events. If you can organize a luncheon wedding party, you can also cut down the costs of the generator set up and lighting. Finger Foods: Make sure you are keeping some arrangements of the finger foods which can be served before the main course. Spring rolls or the drumsticks go best for the finger foods. Non-alcoholic Bar: The parties where children and abstaining adults are involved ensure that you are arranging the non-alcoholic bar in a separate counter. Soft drinks and spirit free drinks can be served there. Never forget the hospitality factor and your smiles. If you are hosting a huge number of people, the meeting and greeting to individuals can be hectic. You can easily meet them during their dinner while they are in groups. You can set up a time limit for the party and can also be mentioned clearly in the invitation cards. This can surely save you from getting tired after long hours of celebration.